first trade edition, 136 pages. 2006. In the mid-1970s, hiding out for nearly a decade, J.D. Salinger had long been a literary legend, the lost leader and vanished wiseman of millions of readers around the world, from the USA to the USSR. An unreachable hero. Or was he? Enter inner-city teacher Greg Herriges, determined to fulfill his dream of meeting and speaking with the reclusive author. Herriges’ tale is a double helix narrative of personal quest and romantic love as he and his former girlfriend, both young, big city high school teachers, hit the road one summer, Kerouac-style, on a mission to find the hidden giant, discovering America – and themselves – along the way. This journey of two young idealistic English teachers who set out to find J.D. Salinger is a love story as well as a tribute to the reclusive author. 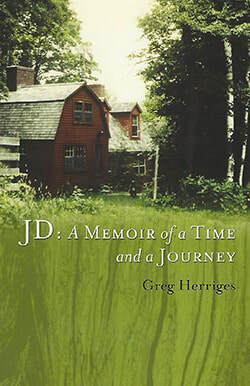 ​"Beyond the vividness with which Herriges conveys the surface adventures, JD is much more than a celebrity hunt. The book's profound human complexities give it emotional depth." Greg Herriges has published three novels: Somewhere Safe, Secondary Attachments, and the twice award-nominated The Winter Dance Party Murders, a murder mystery satire of the golden days of rock and roll (Wordcraft of Oregon, 2006). His short works have appeared in Chicago Tribune Magazine, Social Issues Resources, The Literary Review, Story Quarterly, Britain's World Wide Writers, and South Carolina Review.He is a professor of English at William Rainey Harper College in Palatine, Illinois.